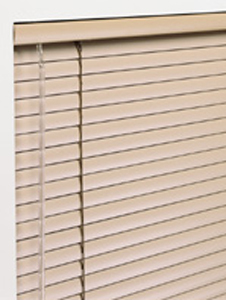 The Bali S3000 provides state of the are performance in horizontal blinds. Utilizing an advanced headrail system, the S3000 offers a number of refinements. A light blocking lip at lower rear of headrail works in conjunction with the top slat to reduce light leakage when slats are closed. Top loading hidden brackets that position the blind closer to the mounting surface and a curved headrail face similar to a slat that eliminates the need for a valance, allows a cleaner installation for improved aesthetics. Optional box brackets with a curved face are available in key colors. Lift cord rollers for easier lifting and lowering and clutch wand tilter are also standard features. Slats: Made of USA manufactured cold rolled aluminum alloy. Slats are nominally 1" wide and available in standard 0.006" or optional 0.008" thickness. Slats are finished with a polyester-baked enamel with a durable antistatic, antimicrobial paint finish. a) Privacy Slat Option provides 18 mm ladder spacing and cord holes that are offset and hidden by slat overlap for enhanced light control when slats are tilted down.